Japanese cedar changes to an ever shinier amber colour with each passing year, projecting an almost indescribable appearance. 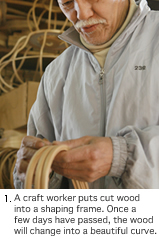 At Miura, we use Akita cedar, which has a particularly fine grain even for Japanese cedar. Miura products are characterized by clear designs with slim wooden frames and for that reason alone, our processing techniques are put to the test.